Micheladas are like a Mexican version of a Bloody Mary, and they're oh-so-addictive. We go back and forth with making these with a cheap, light Mexican beer like Tecate and a more expensive, dark Negra Modelo. I like to mix them up by the pitcher, because each person will want at least 2 or 3. For the Lush Chef Taste Tasters, I make these extra spicy, but the below recipe from Imbibe Magazine only has minimal heat. It's easier to add the spice, then subtract it. - Place the tomato juice, lime juice, hot sauce, Worcestershire sauce, onion, 1/2 tsp chile powder and 1/2 tsp salt into a blender, and process until smooth. - Rim a glass with lime juice and run through the chile powder/sea salt mixture. 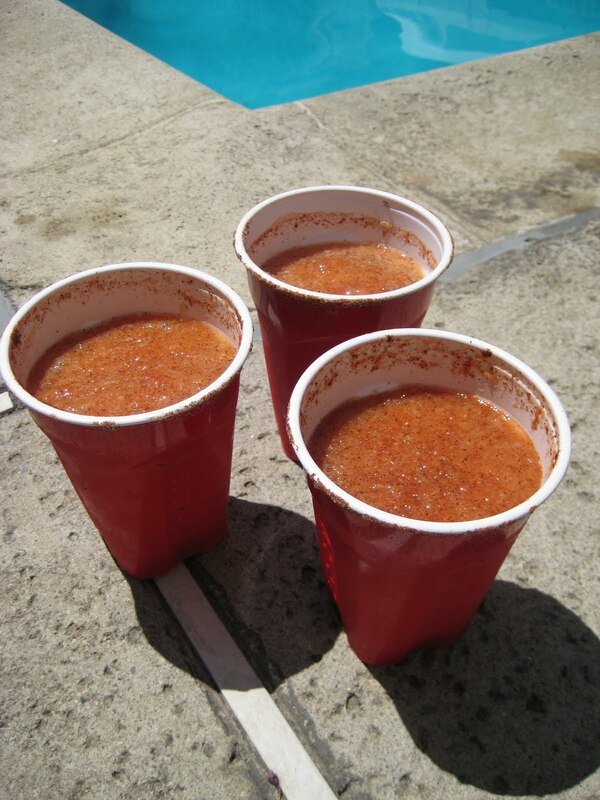 - Add ice and fill the glass 1/4 full with the Michelada mix. - Top with the beer and garnish with a lime wedge. yum! I'll be making these this weekend!